I was delighted to be the keynote speaker at this conference in May 2016, organised by the Centre for Global Ethics at the University of Birmingham. More details of the conference here. I gave the Alan Milne Memorial Address at Durham University in October 2016. You can find details of that series here. I had a fascinating time presenting at a conference on “Beyond the Nuclear Family” at Umea University in September 2015. More details here. Proceedings of The Aristotelian Society (2013). This paper sets out the case for abolishing state-recognised marriage and replacing it with piecemeal regulation of personal relationships. 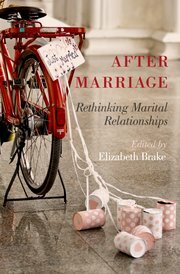 It starts by analysing feminist objections to traditional marriage, and argues that the various feminist critiques can best be reconciled and answered by the abolition of state-recognised marriage. The paper then considers the ideal form of state regulation of personal relationships. Contra other recent proposals equality and liberty are not best served by the creation of a new holistic status, such as civil union, or by leaving regulation to private contracts. Instead, the state should develop piecemeal regulations that apply universally. You can read the paper and listen to the podcast here or on the OUP Philosophy Festival Reading List here. I participated in this excellent event at the University of Birmingham. Details here. 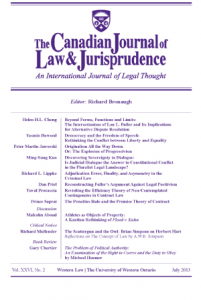 Canadian Journal of Law and Jurisprudence (2009, 1). 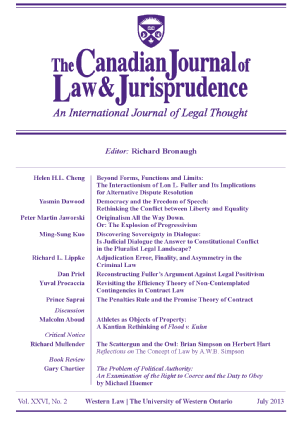 This article responds to Alan Brudner’s Constitutional Goods. It argues that Brudner’s concept of liberal inclusivity is problematic both conceptually and normatively, and results in policies on marriage and abortion that liberals would not accept. Issue No. 2 includes a response from Brudner.